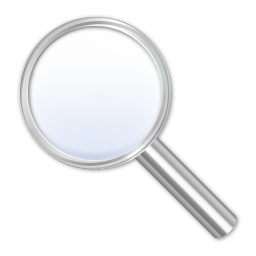 In a previous article entitled “Should Your EHR Documentation Templates Include Chief Complaint Specific Content,” we emphasized the importance of providing chief compliant-specific content in physician documentation templates for medical specialties that are susceptible to diagnosis-related errors. Let’s advance that concept a step further and explore what other features could be built into an EMR to increase compliance with the key drivers of clinical decision-making in the history and physical exam. For example, would it make a positive impact on patient safety if certain clinical elements in the template were highlighted to draw a greater level of awareness and compliance? For the sake of this discussion, call that “Guidance.” What does that look like? The image below is an example of what Guidance looks like in a new physician documentation application called Medical Professor™. This first example is part of a chief complaint chest pain template; Onset and Migration (Movement) of Pain are highlighted. Both the question of whether the Onset of Pain is slow or sudden and the issue of Movement or Migration of Pain are key drivers in the consideration of thoracic aortic dissection. Thus, they are highlighted in red. The practitioner does not need to address those sections or queries (i.e., not a hard stop), but there is a passive reminder that these are important issues in certain chest pain patients. Once addressed, the red turns back to green. When there is no red remaining, the practitioner has addressed the Guidance. This begs the following questions: Does Guidance work? If you build it, will providers use it? Again, the answer to both questions is yes. Building key risk, safety and quality driver Guidance into the EMR workflow in a seamless, non-hard stop fashion improves compliance with documentation and dramatically reduces variability among practitioners. In other words, it brings clinical practice patterns and documentation into alignment. 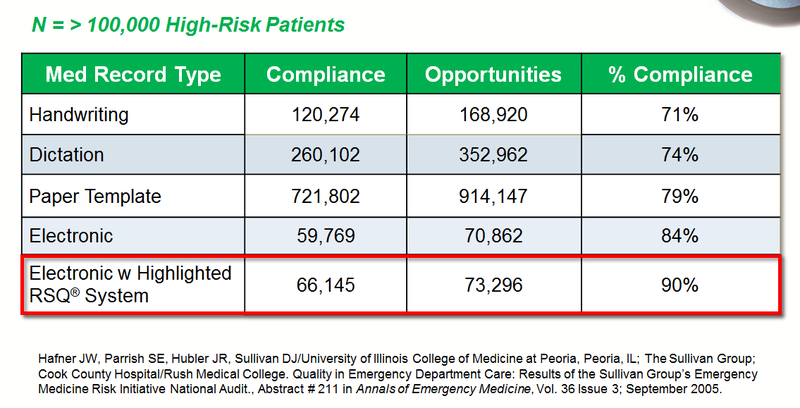 The table below demonstrates the percent compliance with documentation of approximately 100 risk, quality and safety content elements in 10 high-risk chief complaints in an analysis of emergency department patients. The data comes from over 200 U.S. emergency departments looking at over 100,000 high-risk chief complaint presentations (e.g., chest pain, children with fever, headache). This data underscores the dramatic difference between writing or dictating into a blank white space without specific content or Guidance and the use of an EMR that provides content and Guidance. Although there are many opportunities to provide functionality to improve the patient and practitioner experience, this single feature alone drives remarkable change. As you will see below, this is not a simple documentation exercise; it improves outcomes and reduces the incidence of malpractice claims. The Sullivan Group has been performing risk and safety analytics for over 15 years and has completed many before-and-after analyses of emergency departments moving from white space to Guided EMRs. There are always two striking results: 1) there is an immediate improvement in compliance into the 90+ range; and 2) the initial striking variability among veteran qualified practitioners immediately disappears. Abdominal pain is one of the most frequent chief complaints in the nation’s EDs. Unfortunately, problems related to the abdomen are a frequent cause of failure-to-diagnose and associated litigation, particularly in patients over 40. Look at the impact that implementation of an EMR with Guidance had in a department that had been using a single general paper template and handwriting. 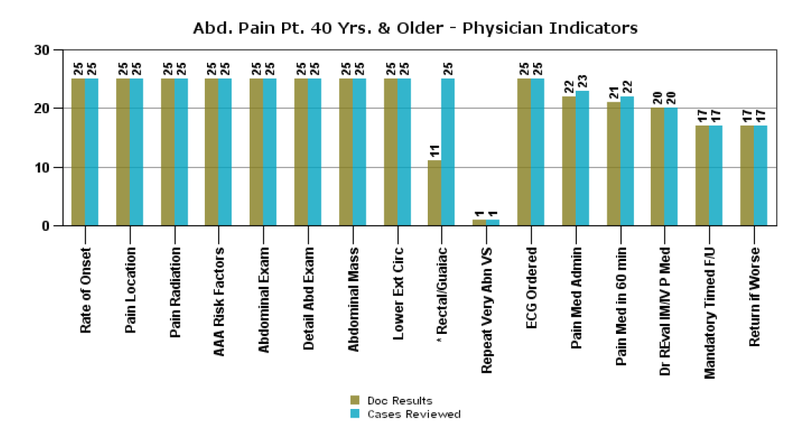 This data is from a 30,000 annual patient visit volume ED with five full-time board certified emergency physicians. The Before and After graphs below represent the first and second quarters of 2015. 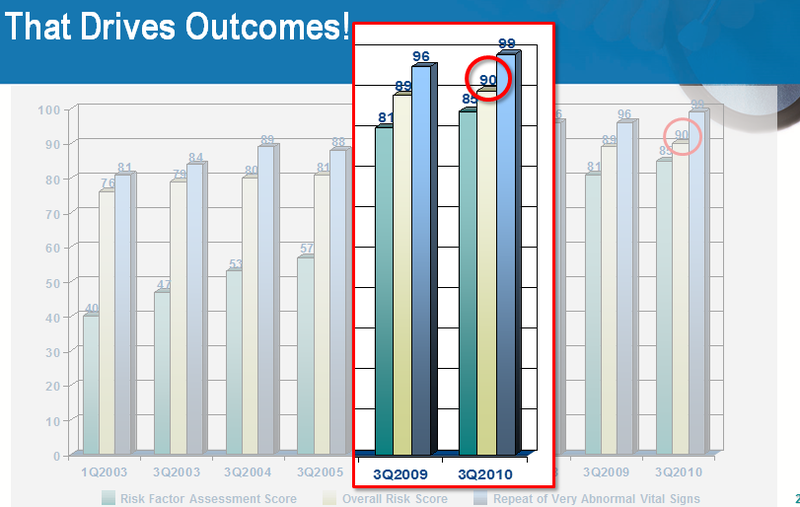 The results demonstrate a dramatic and rapid change in behavior and compliance with the Guidance. Each of the elements on the horizontal axis represents a data element or Guidance. 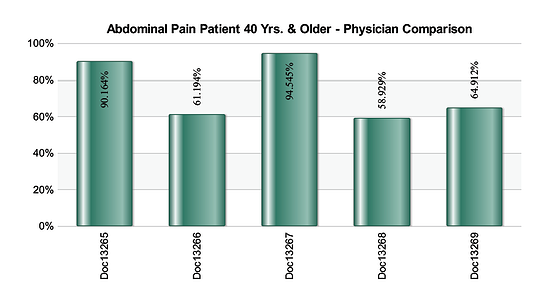 The following graphs look at all the data points for all the abdominal pain patients for each practitioner. Thus, they demonstrate if there is variability in documentation of the key risk, safety and quality elements or Guidance for abdominal pain patients over the age of 40. The Before graph demonstrates dramatic variability and documentation and practice patterns. The five emergency medicine board certified physicians are not aligned around basic clinical data points in one of the highest risk presentations in the specialty. The After graph shows that in one quarter, the practitioners came into near complete alignment. 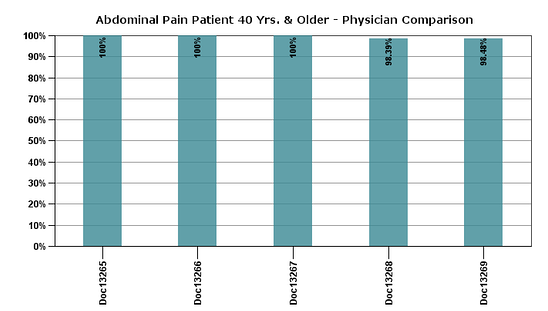 Documentation is complete; the practitioners have all addressed the key Guidance issues related to risk, safety and quality in abdominal pain patients over the age of 40. So content is important in the “take all comers” medical environment, and Guidance within an EMR achieves a high level of compliance with key drivers of medical decision-making. That begs the all-important questions: Does that make a difference? Does it improve clinical outcomes? 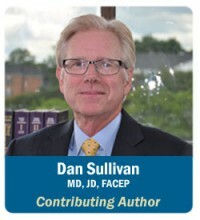 In a 9-year program in one of the largest healthcare organizations in the world, The Sullivan Group provided Guidance to over 100 emergency departments with over 6 million patient visits per year — initially in the form of online education and a Risk and Safety Evaluation, which produced compliance data that was shared with the practitioners. That Guidance was ultimately built into the organization’s emergency medicine EMR. Although achieving 90% compliance with Guidance takes longer when it is not inside an EMR, the concept is the same regardless. 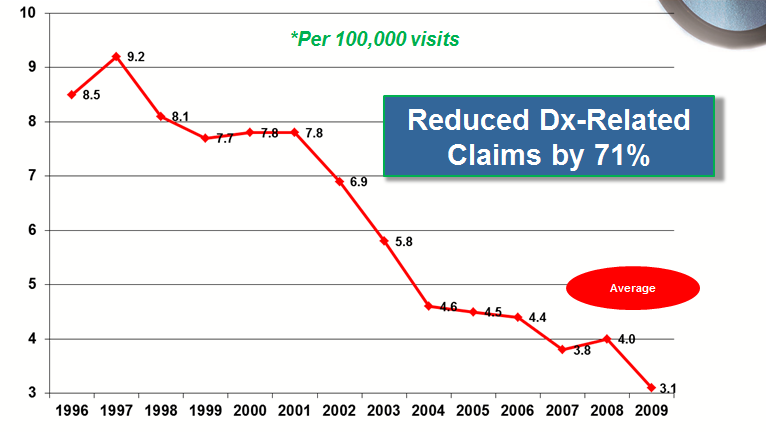 The entire organization moved from 74% to 90% compliance with risk, safety and quality Guidance (see graph below). Thousands of emergency practitioners came into clinical practice pattern alignment around the highest risk presentations in emergency medicine. The following graph demonstrates that the reduction in the number of lawsuits from well over the national average to under the national average corresponded to the increase in compliance with risk, safety and quality indicators. Although this occurred over a period of almost a decade, the principle remains. In the emergency environment and presumably in other “take all comers” environments, arriving at over 90% compliance with key risk, safety and quality Guidance drives decision-making and can improve outcomes and reduce the incidence of litigation.